David was born in Schenectady, New York in 1954 and was raised in the town of Charlton. He and his brother were raised by two loving parents in a Roman Catholic home. David and his younger brother, Paul, attended mass and catechism and were confirmed in a Catholic church to fulfill a vow made by their father. David became disillusioned by the Catholic Church during his teen years, but had a life changing conversion experience at the age of 18 while attending Plattsburgh State University. He began his new life reading, studying the Bible intensely, and worshipping with others in church services and Bible studies geared toward college students. David, together with his friend Eric Handel, started a Bible Study in their home town of Burnt Hills, NY. This Bible Study eventually grew to become the church which it is today, Greater Grace Community Church. Pastor Moore graduated from both Stevens School of the Bible in Lenox, Massachusetts and Maryland Bible College and Seminary in Baltimore, Maryland. 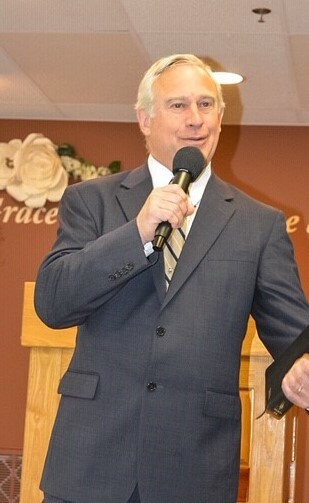 He has served as the Senior Pastor of Greater Grace since 1977. Pastor Moore is happily married to his wife, Cynthia, a graduate of Alaska Bible Institute and a teacher at a local Christian school. The Moore’s currently live in the town of Charlton and have raised five daughters. Their oldest daughter is married with three sons.